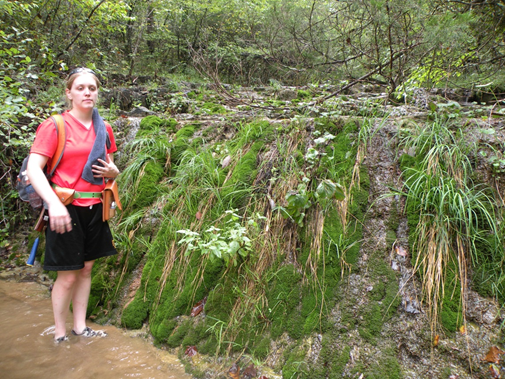 On a recent fieldtrip I realized how many great geologic features exist in the Everton Formation of northern Arkansas. Here’s a little background on the Everton Formation. 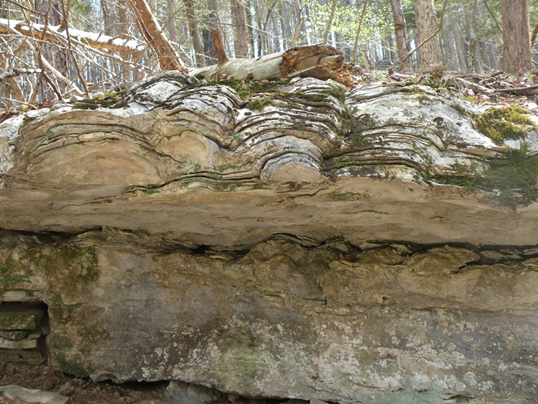 The Everton Formation is named for exposures near the town of Everton in Boone County, Arkansas. All geologic formations are named for nearby geographic locations. This formation was deposited during the Middle Ordovician Period which means it formed around 470 million years ago. It crops out across northern Arkansas from Beaver Lake in Benton County to Sharp County. Depending on where you are in that portion of the state you might see sandstone, limestone, dolostone, or all three rock types. Now let’s look at some neat features in the Everton Formation. We’ll start with stromatolites. Stromatolites are laminated structures built by blue-green algae, also called cyanobacteria, one of the simplest and earliest known life forms. Notice the mounded laminations in the photo below. 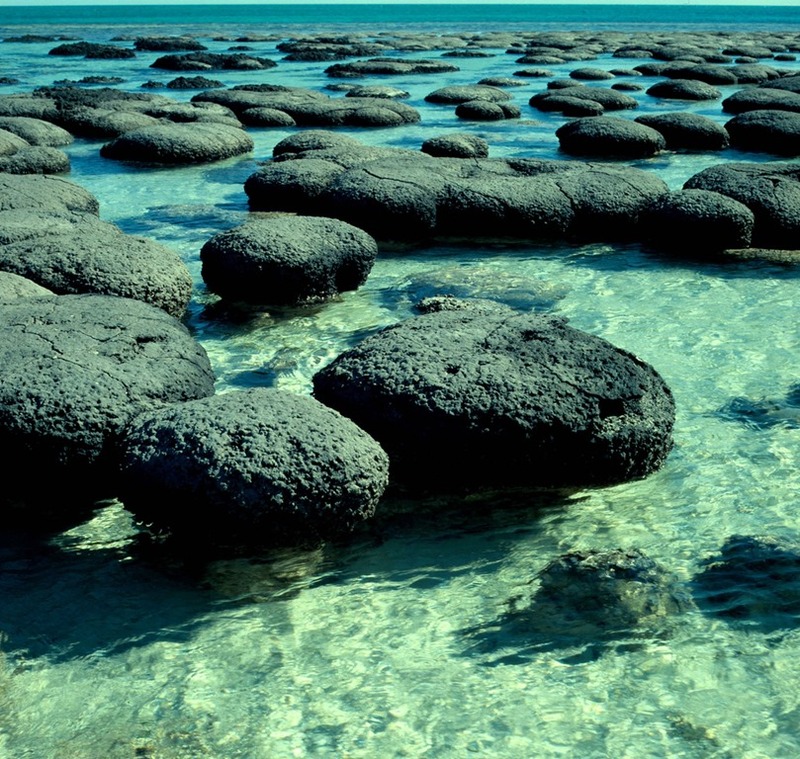 These are stromatolites. The rock is a fine-grained limestone. Also notice the bumpy, weathered surface mid-photo. This is where individual stromatolites are weathering out of the rock. The next photo shows a better look at the top of this weathered surface. 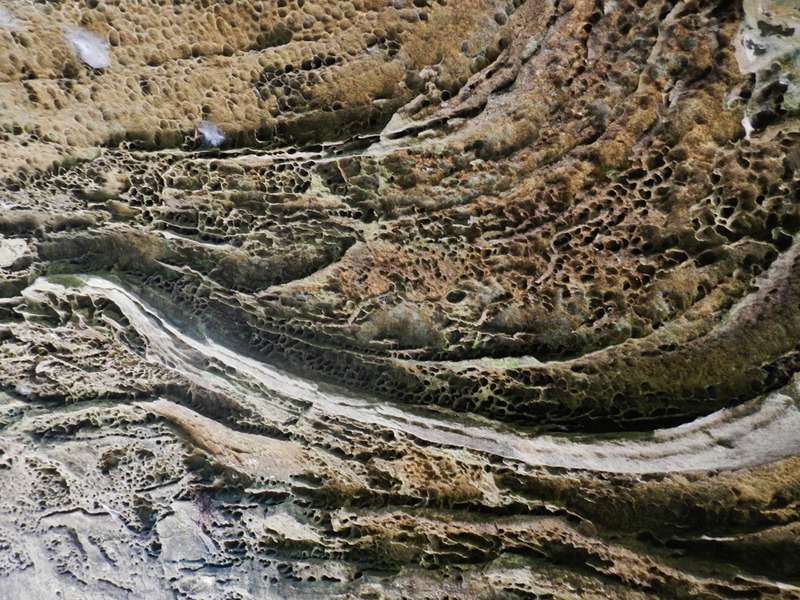 Finding these fossilized accretionary structures in outcrop helps geologists determine the environment in which this rock formed – in this case, a tidal flat. 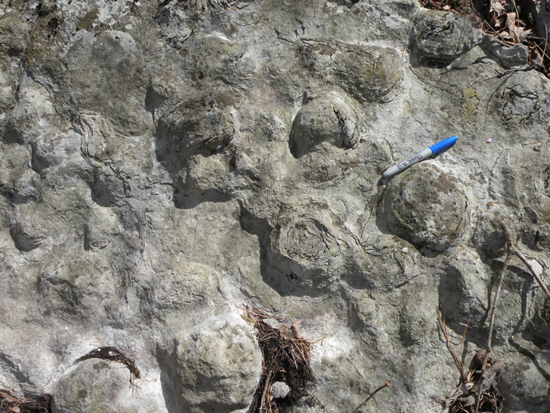 The next photo shows that modern stromatalites are still forming in similar environments today. Next, let’s look at travertine. Travertine is a chemically-precipitated, continental limestone composed of calcite or aragonite that forms around seepages, springs, and along rivers and streams (Pentecost, 2010). Precipitation results primarily through the transfer of carbon dioxide to or from a groundwater source, which leads to supersaturation and crystal growth on surfaces. Travertine cascades and dams are present on many of the small streams that are sourced by springs issuing from the limestone and dolostone of the Everton Formation. 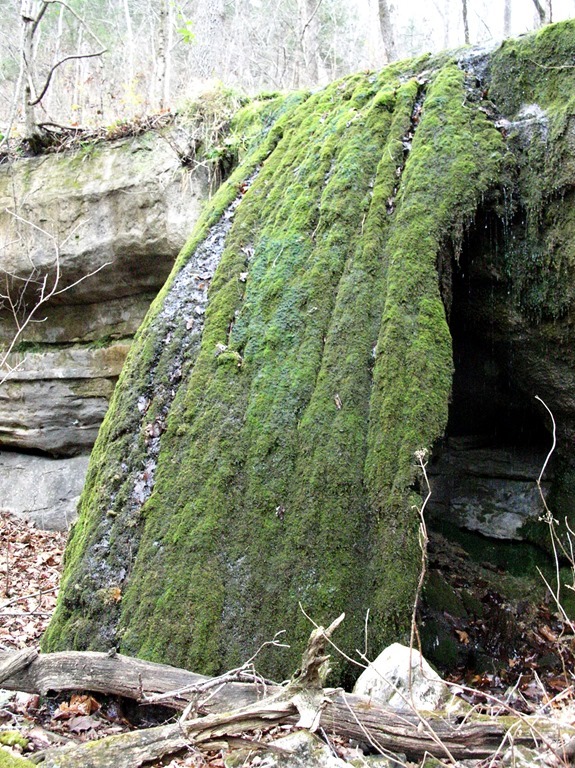 The first photo shows a travertine cascade over a dolostone ledge. The second photo shows a geologist standing beside a tall travertine dam across a small creek. Finally, have a look at these fossilized mud cracks. These formed in a similar way to modern mud cracks. 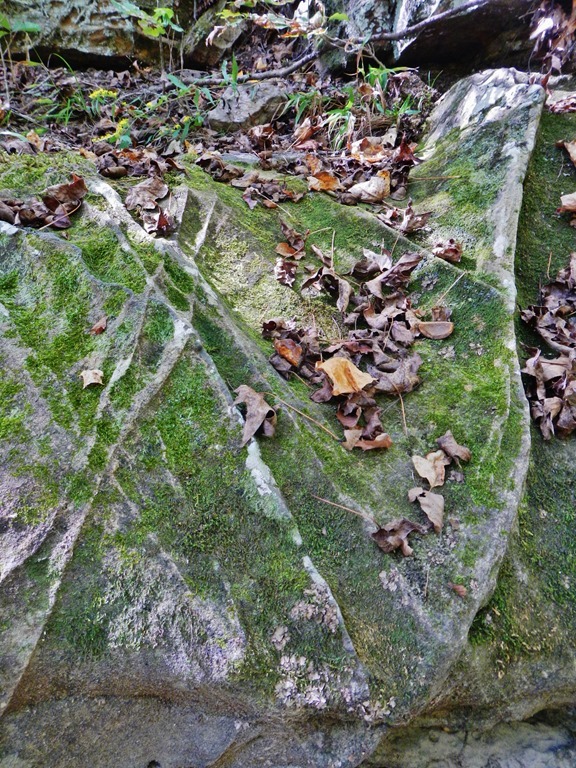 These rocks were originally mud that dried out and formed polygonal cracks. These were later filled with additional mud and over time all of it lithified into dolostone. Mud cracks preserved in this manner are another clue that helps geologists determine the environment in which the sediment was deposited. Again, this would indicate a tidal flat. Till next time. Get out in the field!! 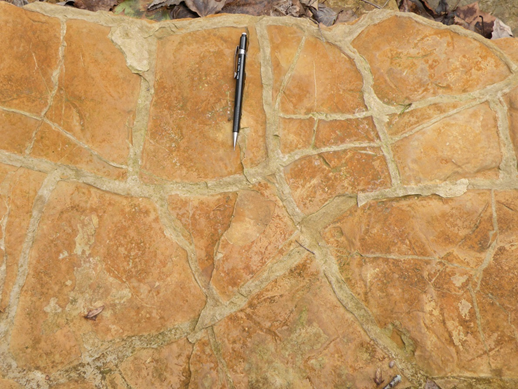 This entry was posted in Notes From The Field and tagged Arkansas, dolostone, Everton, Geology, limestone, mud cracks, Ordovician, sandstone, stromatolites, travertine on April 6, 2016 by argeology. 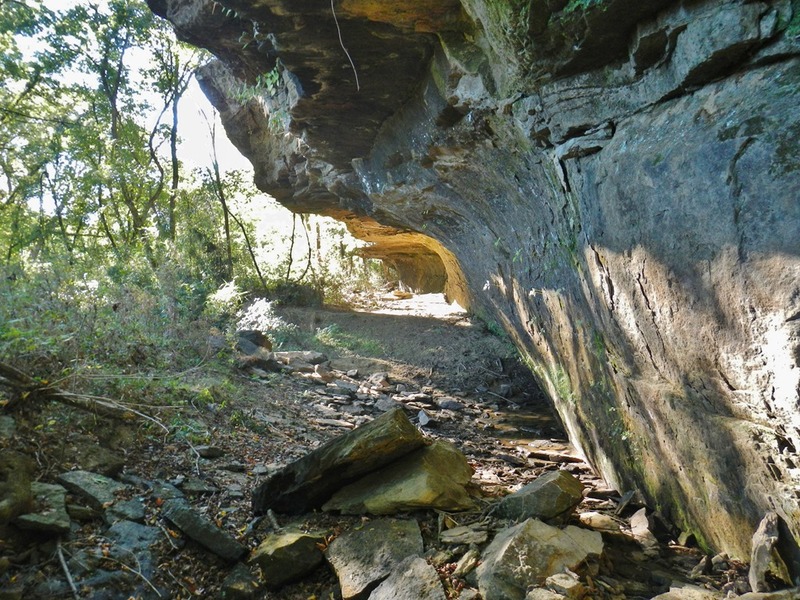 This entry was posted in #geoblog, GeoPic of the Week, More Views and tagged Arkansas, dripstone, limestone, sedimentary rock, travertine on December 11, 2015 by argeology. 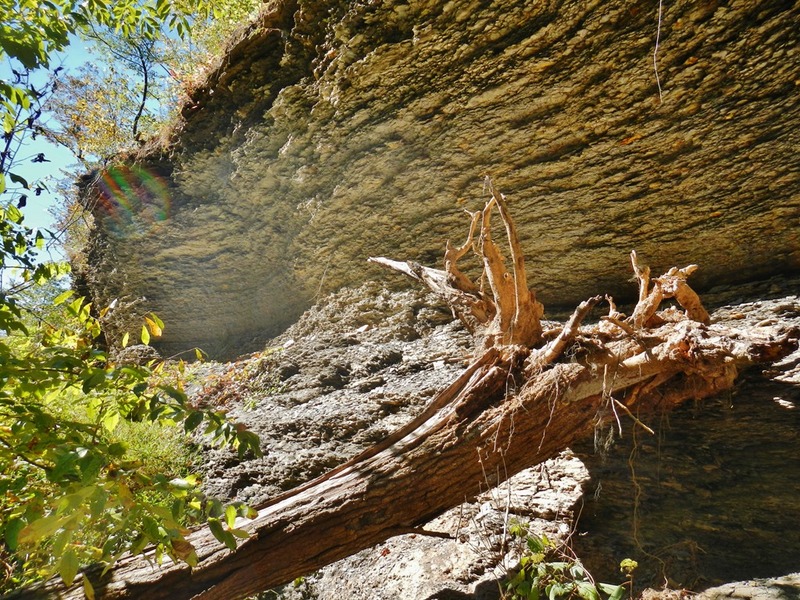 Travertine is a common feature in the northern Ozarks and along the Buffalo River due to the abundance of soluble limestone there. 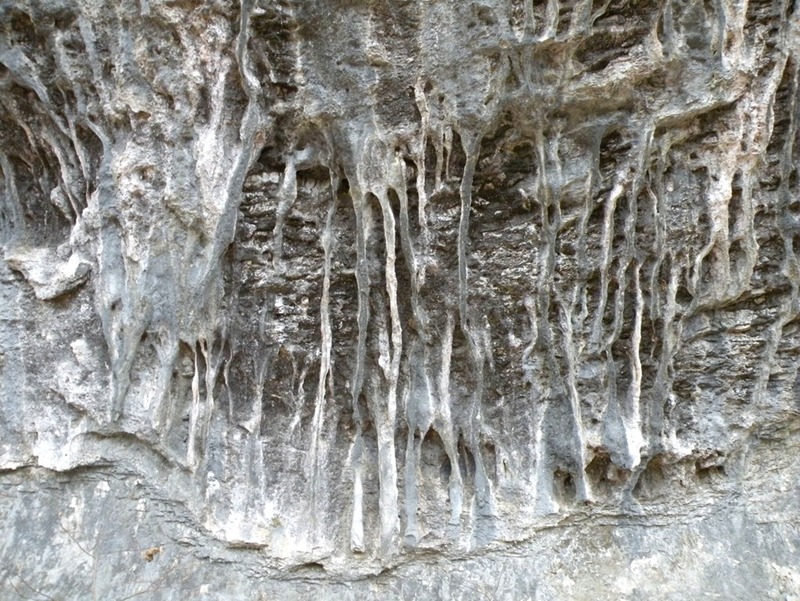 Common in caves (stalactites, stalagmites), travertine forms by the precipitation of minerals from ground water. In the example above, it formed on the face of a bluff, giving the bluff a melted appearance. Like limestone, travertine is composed of the mineral calcite which dissolves if exposed to acid. When rain falls, it picks up CO2 from the atmosphere and soil, and becomes slightly acidic. It then flows underground through the bedrock dissolving some limestone along the way. When the groundwater re-surfaces at a spring or seep, The pressure drops, forcing the CO2 out of the water. The loss of CO2 lowers the waters acidity; It can no longer hold the calcite in solution, and calcite precipitates as the sedimentary rock travertine. 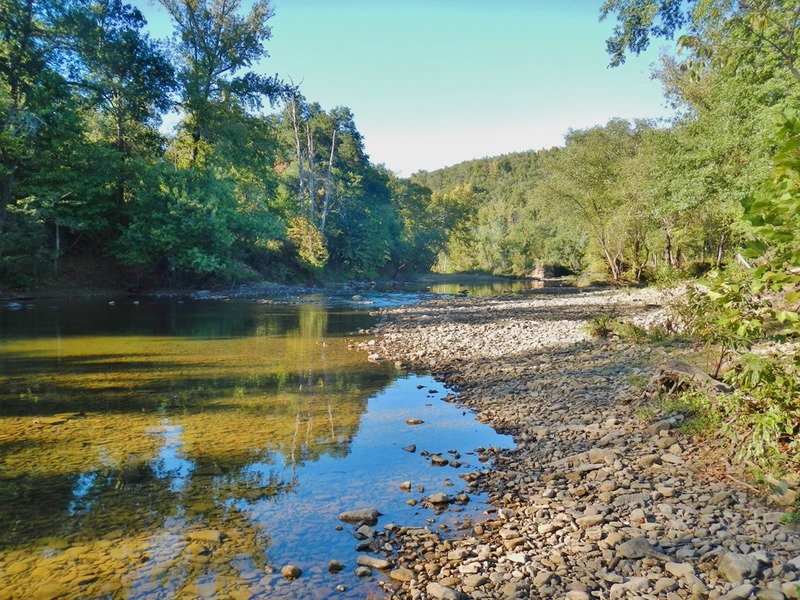 This entry was posted in #geoblog, GeoPic of the Week and tagged Arkansas, Buffalo River, dripstone, limestone, Ozarks, sedimentary rock, travertine on December 11, 2015 by argeology. 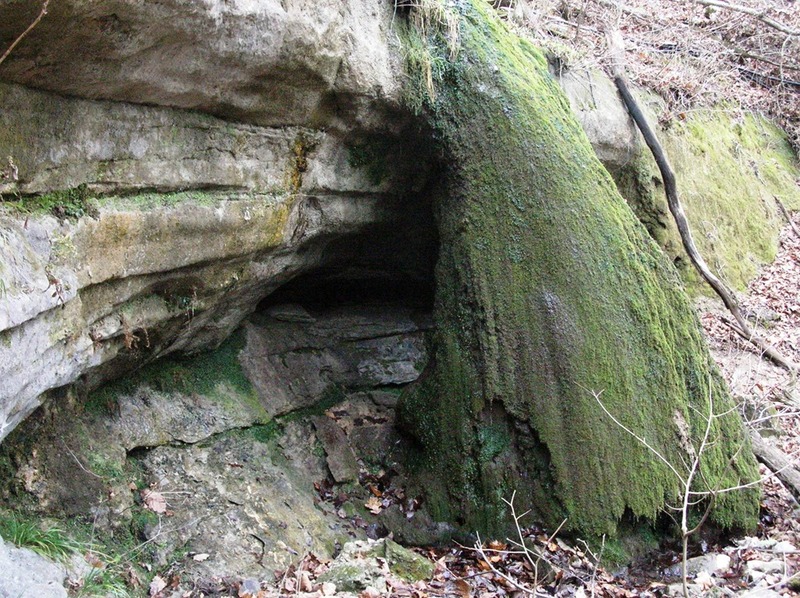 This entry was posted in More Views and tagged Arkansas, karst, Plattin Limestone, St. Peter Sandstone, travertine, Travertine falls on July 23, 2015 by argeology. Pictured above is a travertine falls. It looks like a waterfall except that, rather than being water, it’s composed of solid rock. Travertine is made of calcite which also forms stalactites and stalagmites. 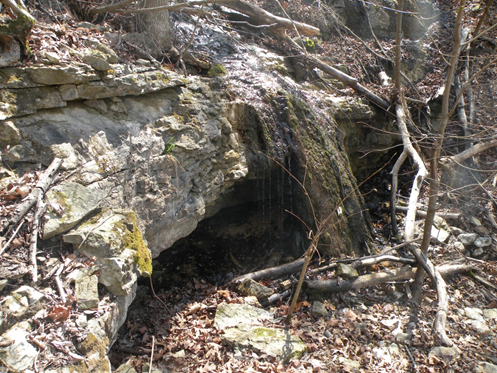 Like those familiar cave features, travertine falls form by precipitation from water; the water is flowing in a creek, over a ledge instead of dripping from a cave ceiling. As the travertine precipitates in layer upon layer, it begins to take on the appearance of flowing rock. Dripstone features like these only form in areas where the groundwater carries a high load of dissolved carbonate minerals. This one was photographed in Searcy County, Arkansas, not far from the Buffalo National River, near the contact between the St. Peter and Plattin Formations. 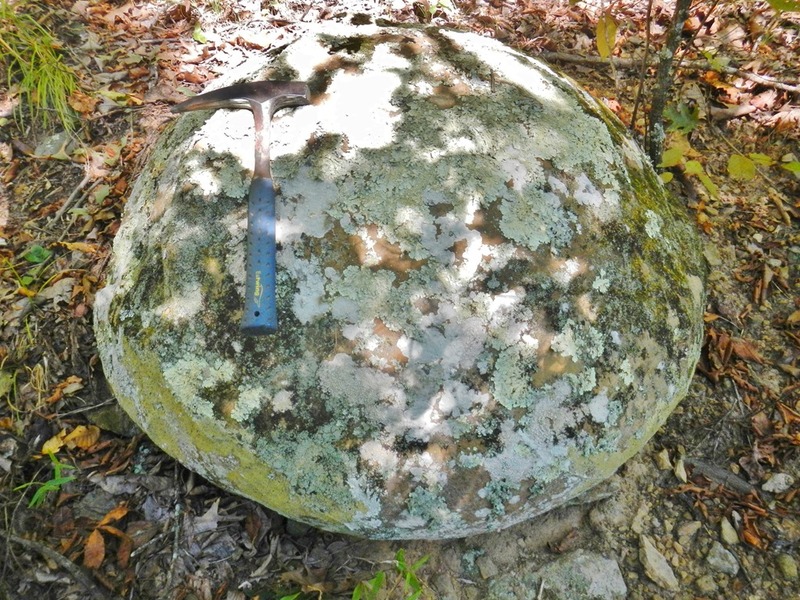 This entry was posted in #geoblog, GeoPic of the Week, Sedimentary Features and tagged Arkansas, flowstone, karst, Ozark Plateaus, Plattin Limestone, St. Peter Sandstone, travertine on July 23, 2015 by argeology. Well, it was good to be back in the field again after a week of “vacation” (painting my daughter’s bedroom). The weather is really getting a lot nicer now, and the ticks have almost given up. We’re still working on the larger tributaries to the Middle Fork, so that they will be done by the time the dry season ends. The Middle Fork is still low enough for us to cross it easily which is good because road access on the north side of the river turned out to be very limited. We finished up the last two big drainages that flow south into the Middle Fork east of Shirley. Mostly a big stack of massive-bedded, calcareous sandstone, but little sign of the shalier Cane Hill which is still prominent along the river to the west. This might suggest that the Cane Hill is either faulted out or that the tilt of the rocks to the southeast brings the Witts Springs to a lower elevation near the large southwest-northeast trending fault just to the south along the river. Whichever it is, we’ll need more data to determine. We did see a good example of travertine precipitating on some of the thin-bedded calcareous sandstone. Slightly acidic groundwater is solutioning the calcium carbonate (calcite) with which this particular sandstone is cemented. 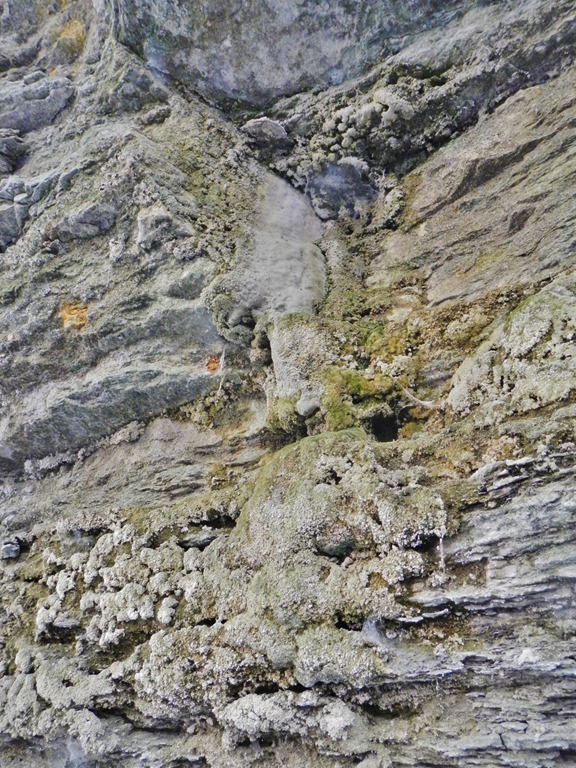 It is then precipitated where the water seeps out of the rock, in this case along a joint. This lets us know that the adjacent rocks are calcareous, which in turn may help us determine what formation it’s in. We also saw some good deformation bands, which as I’ve said in a previous post is one of the signs that a fault is nearby. These were in float, and though I looked high and low, I couldn’t find the source. Certainly evidence of a lot of stress in these rocks! The other drainage we looked at is north of Shirley and is extremely steep and badly overgrown. The sides were so boxed in we couldn’t come down the main channel, and had to try a side branch. We did make it down that way, but with great difficulty. Once we got to the bottom, we could only get within about 40 feet of the Witts Springs/Cane Hill contact in the main channel, because the lower end was boxed in as well. We usually don’t give up until we get our point, but this one was deemed impenetrable. The break is visible in the contours, so shouldn’t be too difficult to draw in anyway. On the way down the side branch, I spied a round rock or “Prim boulder”. These are definitely coming out of the Witts Springs. 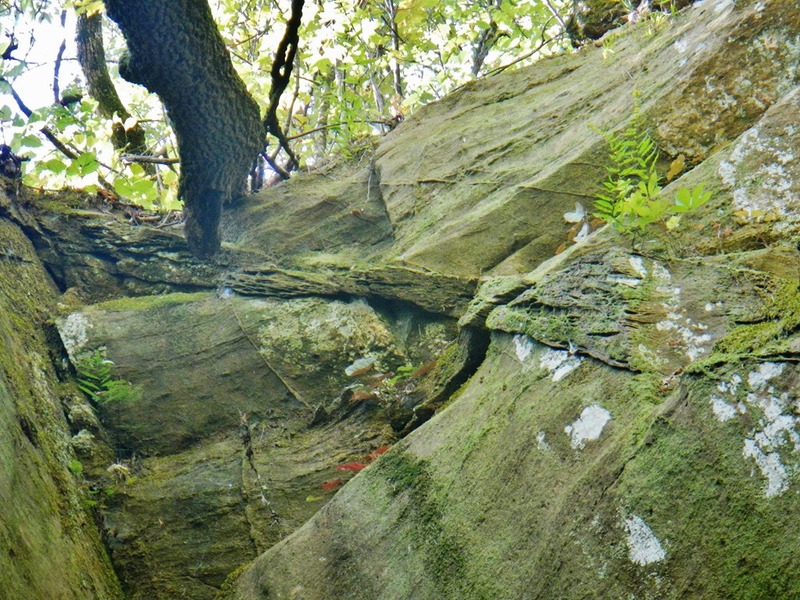 Also saw more deformation bands, this time way up at the top of a 40 foot massive of basal Witts Springs sandstone. That band you see in the close-up is about 6 inches wide! The last photo is the Cane Hill in the box canyon below the contact. 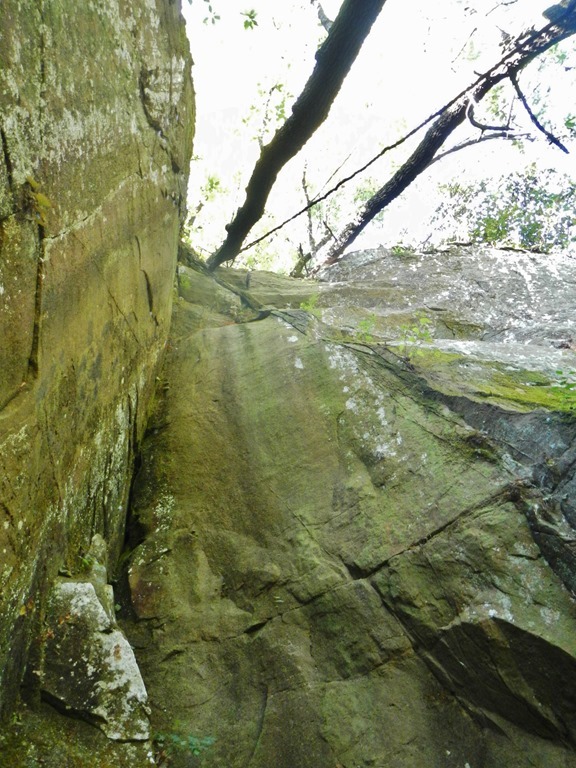 The sheer bluff of massive Witts Springs sandstone was visible on both sides above. I was rewarded by finding a large patch of muscadines on the way out. They continue to get sweeter each week! Wish I could have stayed to fill a bucket, but had to make do with a pocketful. Made a nice snack during the hike back to the Jeep. This is definitely a banner year for the muscadine crop! Hope y’all have a good week, and see you on the outcrop! 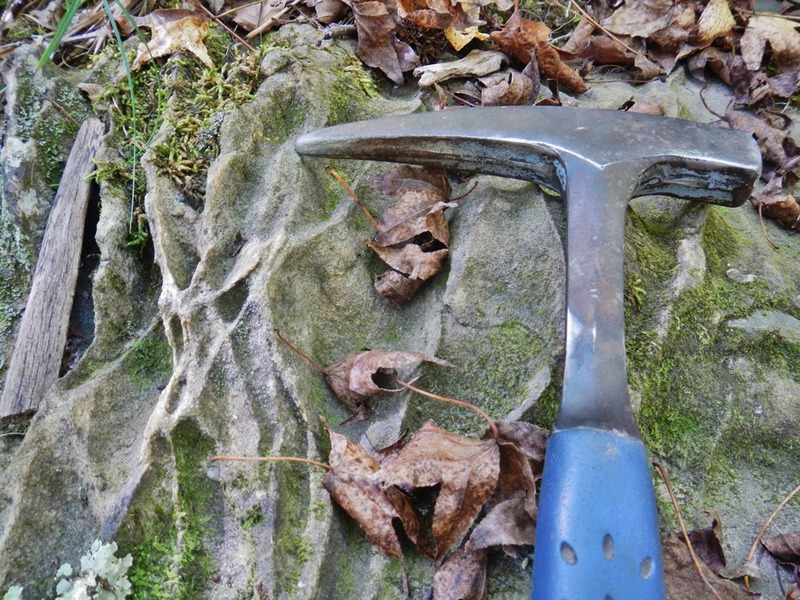 This entry was posted in Notes From The Field and tagged Cane Hill, deformation band, Middle Fork, Prim boulder, sandstone, Shirley, travertine, Witts Springs on October 31, 2013 by argeology.